Carmen grew up on a small farm with his parents and eight siblings just down the road from where he now owns and operates A-Frame Farms. A-Frame Farms is an organic operation he and his wife Sally started in 1972 with 80 acres. Today, the Fernholz’s raise certified organic small grains, corn and soybeans on around 360 tillable acres. Over the years Carmen has been recognized as a leader in the organic field and plays an important role in counseling farmers and others who are interested in this type of agriculture. Conservation and water quality are important factors for how Carmen manages his farming operation, incorporating a wide variety of Best Management Practices (BMPs). On the Fernholz Farm a person will find a controlled flow tiling system that holds back water during drier periods and at higher flows it outlets into a wetland. This helps prevent excessive nutrients and sediment from reaching waterbodies like the Lac qui Parle River. 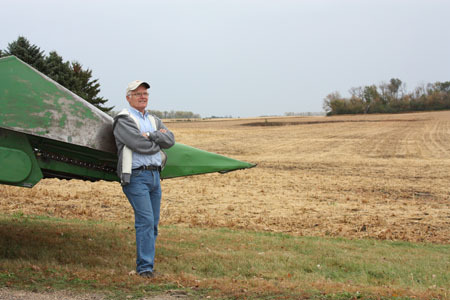 In addition, he utilizes other BMPs like conservation tillage, terraces, and windbreaks. 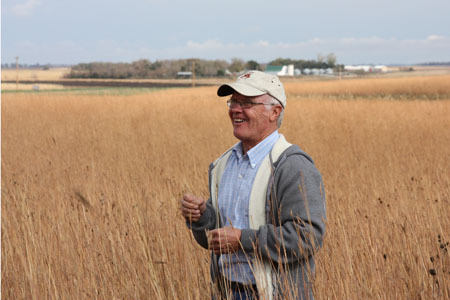 One of the proudest accomplishments for Carmen is his 100 plus acre Conservation Reserve Program (CRP) easement with its native grasses and large wetland. Involvement in organic agriculture plays a major role in Carmen’s life and it has been this way since he started farming close to 40 years ago. His desire to learn more has led him to be involved with research projects through institutions like the Minnesota Southwest Research and Outreach Center and he works for the University of Minnesota Morris on local food issues. Carmen served a variety of boards including the Board of the Minnesota Institute for Sustainable Agriculture (MISA), the Lac qui Parle County Resource Commission, and the Lac qui Parle Lake Association.